In the seventeenth century France was among the real powers in Europe. Wealth was flowing into the country from colonies and there was an aristocracy anxious to own objects of luxury. Talented craftsmen from other parts of Europe emigrated hoping to find a clientele for special objects. Pierre Golle was born in Holland around 1620. He apprenticed himself to an atelier in Paris in 1643. He married the master’s daughter and eventually took over the workshop. His work was sought out by many well-to-do clients, including the king. Exotic materials, such as tortoiseshell, ivory, horn, and bone and colorful tropical woods, were finding their way to Paris. 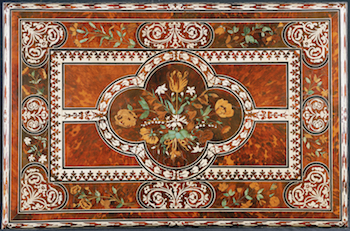 Golle became a master of veneering with these sumptuous goods. 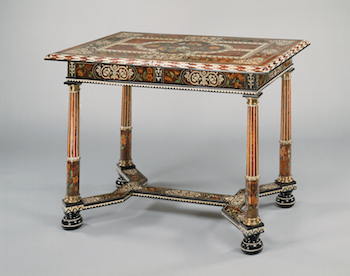 The lovely table made by Golle around 1660 and now in the Metropolitan Museum in New York is a wonderful example of eye catching marquetry.